U.K. retailer The Watch Gallery has released an interesting one-minute video that very nicely shows something you don’t see every day: a watchmaker dismantling a Rolex 3135 movement right at his workbench in London. Looking at this video reminded me of what a great movement Caliber 3135 is. Its less fancy movement finish and less exclusive image is counterbalanced by the fact that the movement never likely to be fickle or give any trouble. Automatic Caliber 3135 is the successor to Rolex Caliber 3035, which was a modern, strong, reliable, and more accurate departure from the brand’s previous slower-beating movements. Used to power the Oyster Perpetual Sea-Dweller, Yacht-Master, Milgauss, and Submariner models, it is also the base movement for the slightly larger-sized Cellini models introduced at Baselworld 2014 (see Does Rolex Make Dress Watches? The Cellini Range Answers That With A Resounding Yes). Thanks to its slightly larger base plate, Rolex is able to add modules to Caliber 3135 to create complications like the second time zone and the unusual date display in the Cellini collection. Caliber 3135 has been in regular use at Rolex since about 1988 with periodic upgrades. One such enhancement came about in 2000: the addition of Rolex’s blue Parachrom hairspring, which required five years of research by physicists and material engineers according to the Geneva-based brand. The Parachrom hairspring warranted two patents: one for the chemical composition of the alloy and one for the surface treatment added in 2005. The Parachrom hairspring is non-magnetic and shock-resistant in particularly effective ways thanks to its unusual paramagnetic alloy containing niobium, zirconium, and oxygen. 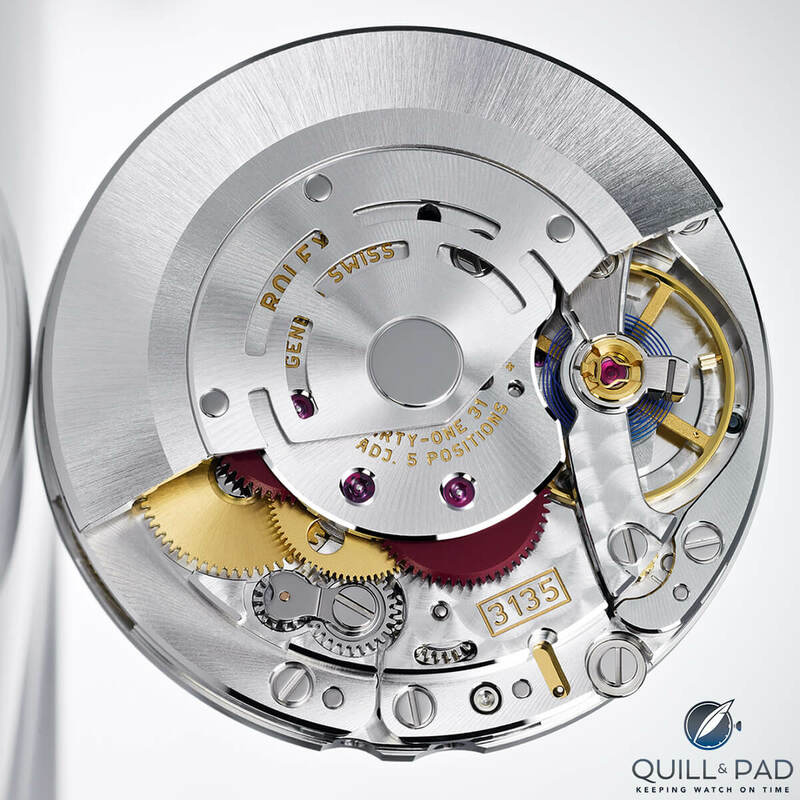 According to Rolex, a Parachrom hairspring is ten times more resistant to shocks than traditional hairsprings. The hairspring, of course, combines with the balance wheel to determine the precision of the watch by the regularity (isochronism) of its oscillations. Rolex’s engineers invented the Microstella screws in 1957, a variable inertia system enabling the fine regulation of the wheel’s inertia. Microstella screws continue to be used to this day with the only difference being that they are now made of gold. The fine adjustment is performed by lightly screwing or unscrewing what Rolex calls the nuts in opposing pairs to retain the wheel’s poise. 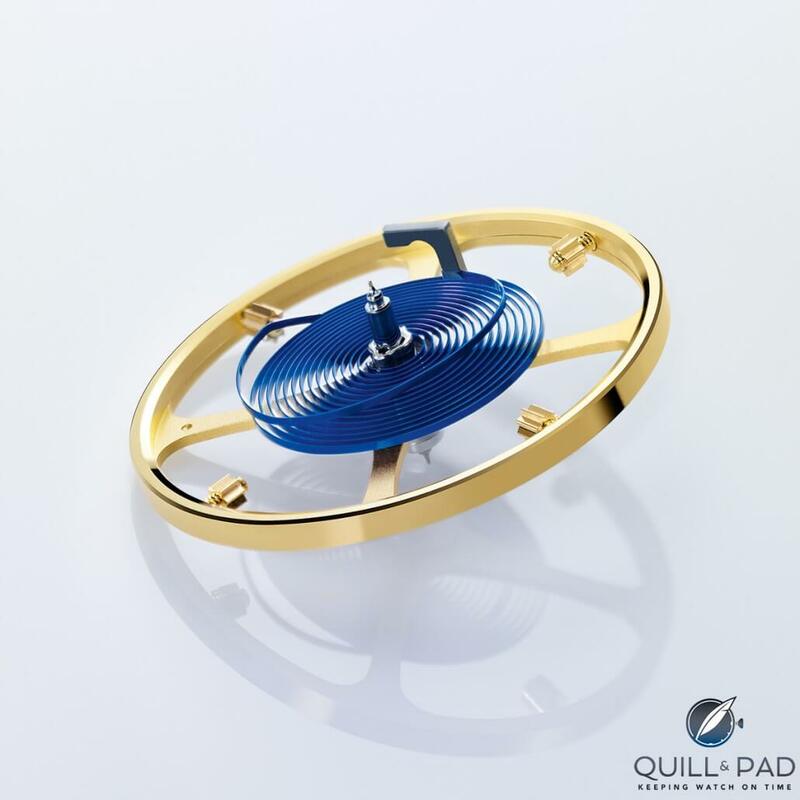 Invented by Rolex in 1931, the automatic winding rotor is a half‑moon-shaped oscillating component that winds in both directions using the movement of the wearer’s wrist as its impetus. In the video and in the photo of the disassembled movement above, it is easier to see the red gear wheels (on the far left) that normally just peek out from behind the automatic assembly. These are coated with Teflon to increase the rotor’s efficiency as it rotates to wind the mainspring. 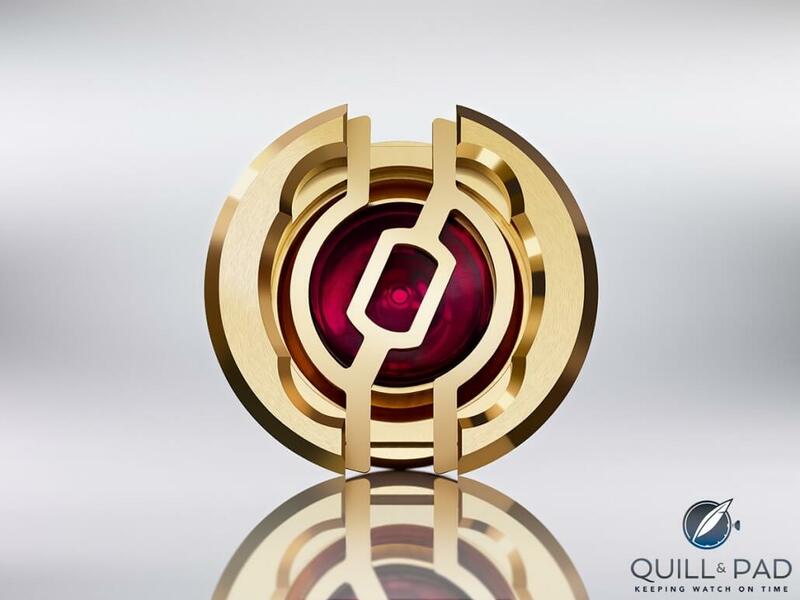 Caliber 3135 is additionally officially certified by the Swiss authority C.O.S.C. as a chronometer-grade precision movement. This delightful happenstance reinforces my thought that Rolex wants us to focus on the elegance of the new Cellini models rather than the mechanical reliability and excellence of their tried-and-tested movements. Caliber 3135, which industry insiders might lovingly call a “workhorse,” has been in reliable use so long that it is free of the types of bugs that plague new movements. Which makes it an excellent choice to use inside an elegant dress watch. After all, when you’re out for the evening in a tuxedo, that’s pretty much the last thing you want to be thinking about. For more information, please visit www.rolex.com. Great write up. One question, the article asserts that newer 3135’s now use Paraflex shock mechanism, but the photos show the original KIF system. Can you confirm that newer 3135’s use Parallax (eg. DeepSea, Ceramic SeaDwellers, etc). thanks for your keen eye! I checked and found out something quite interesting, which I too was less aware of: the 3135 itself doesn’t have the new shock system, but some of the 3135 family calibers do, the ones that have a larger main plate. This isn’t visible from outside the watch, nor is it common knowledge from what I’ve been able to gather. Thanks for pointing that out!